This walk: 2011-2-3. Two Bridges hotel bridge, River Cowsic, West Dart River, gnarled "Walt Disney" trees, bracket fungi, Beardown Farm, Devonport Leat, sheep leap, sluice, Wistman's Wood, Longaford Tor, clapper bridge, Littaford Tor, Crow Tor, ice, leat take-off points. The old bridge at Two Bridges that runs into the Two Bridges Hotel. Plaque on the newer, road bridge. Confluence of the River Cowsic, coming in from the left, and the West Dart River. A gnarled tree base along the path just north of Two Bridges. A "Walt Disney" form of tree beside the West Dart. Bracket fungus on a felled tree. The bridge over the River Cowsic just before reaching Beardown Farm. Looking into the yard of Beardown Farm, the footpath turns right here. Our first meeting with the Devonport Leat; beyond the clapper bridge it runs through non-access land. A sheep leap across the leat. Here the leat bends left and enters Beardown Plantation. Looking back from the same point towards the Two Bridges Hotel. The runway from the sluice, down through the woods towards the West Dart. Looking across the West Dart valley towards Wistmen's Wood with Longaford Tor behind. A clapper bridge with Littaford Tor behind. Looking back down the leat with the West Dart in the valley and Wistman's Wood in the distance. Looking across the West Dart at Wistman's Wood with Littaford Tor behind. Devonport Leat (at left edge of photo) with the West Dart River in the valley below. Some ice, still laying beside the leat. The leat passes through the valve beneath the two winding pillars surrounded by the railings and the West Dart continues downstream at the right side of the photograph. Another view of the river continuing on its course. Looking down-river (at left) and into the leat (at right), with the valve gear in the foreground. An outcrop on Beardown Tor with the MOD flagstaff showing a red warning flag. Beardown Tor, SX 602 773, elevation 513 metres (1683 feet). There was an army lookout hut just out of sight on the right. Looking back from Beardown Tor. Devonport Leat takeoff point on the River Cowsic, it was too boggy to approach closer from this side of the river. Meanderings in the River Cowsic. A holed stone in the garden of the Two Bridges Hotel. 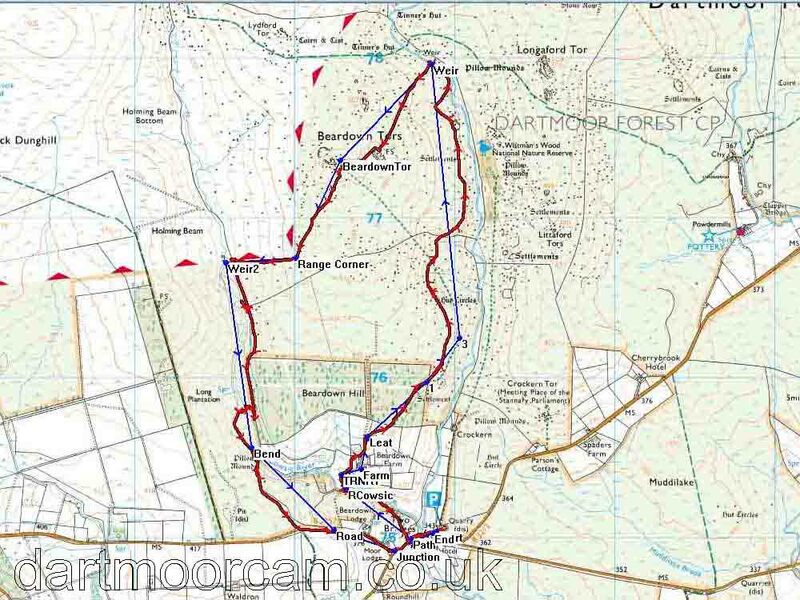 This walk was accessed from the old quarry car park on the Tavistock (Princetown) to Moretonhampstead (Postbridge) road.